Added by Indo American News on March 6, 2015. Get ready to be mesmerised by some hi-fi VFX laced mythological treatise featuring the most magnanimous warrior of Hindu mythology, Karn. Sony Entertainment Television has released a 30-second teaser of its ambitious next titled, Suryaputra Karn (Swastik Pictures). The first teaser presents the larger-than-life warrior King of Anga, Karn standing right in the middle of a typhoon, nonchalant about the danger whirling around him. The teaser deftly focuses on his well-sculpted back as he prepares to launch his divine arrow in to the sky to stop the destroyer of the Universe from wrecking anymore harm. What captivates one is the shining armour that shines radiantly from Karn’s body. 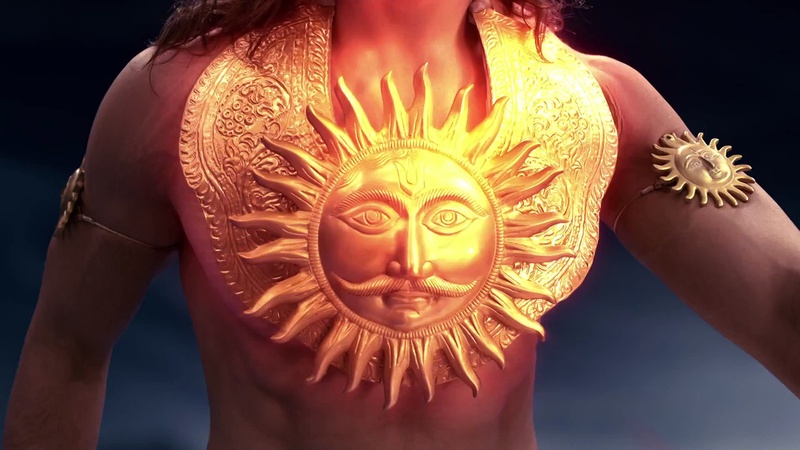 Known as the child of Sun god (Karn was born to Kunti with the divine blessings of Sun god), Karn was born with an invincible armour around his chest and gold earrings giving him the appearance of a mini-Sun on earth. The camera does well to pan on the divine chest armour that shines with brilliance. As Karn lifts his heavy bow, one can’t help but marvel at the intricate designs of his weapon. And just when you feel like soaking in the feeling a bit more, there is a rush as Karn shoots his arrow which emerges out as shining rays of sun lethal enough to burn down any enemy in this universe. The makers have for the moment chosen to keep the identity of Karn discreet.